My kids are getting to the age when they're interested in computer games too. I think I might need a second computer! They start earlier and earlier. So cute. My daughter loves the computer games that they have at Sprout Online. That's all I'm willing to let her try for right now! Captivating! That looks exactly like my laptop!! LOL Julie's blogger in training comment cracked me up! That must be some game to get everyone interested like that. I remember having games that my brother and I would play together for hours. Such fun. I left you a blog award today so drop by and pick it up! This photo makes me uncomfortable. I know computers are a part of today's world but I still have a hard time being okay with letting my kids do things on them. hard for me to embrace technology for kids. I just prefer them to play outside and use their imaginations more. Great photo for discussion purposes. My girls love the computer, too! Happy WW! Tough call. We want our kids to be comfortable and competent on computers – yet we also want the use their imaginations and play outside. I'm finding that one they 'taste' online videos and games it is so much more difficult to get them to want to play anything else. My kids love the computer. There are so many great learning games! We hardly let them on at home, but when we go to the library they get to play for 15 or 20 minutes. Makes the library that much more fun! That totally looks like my house. Looks like they're having a great time! Computer games can be great, but like tv there is such a thing as too much of a good thing! Thanks for stopping by and linking your WW post up over at my place. Have a great day! My kids love them too. Bloggers in training, lol. All these posts about our kids may come back to haunt us one day! That's great they are sharing. 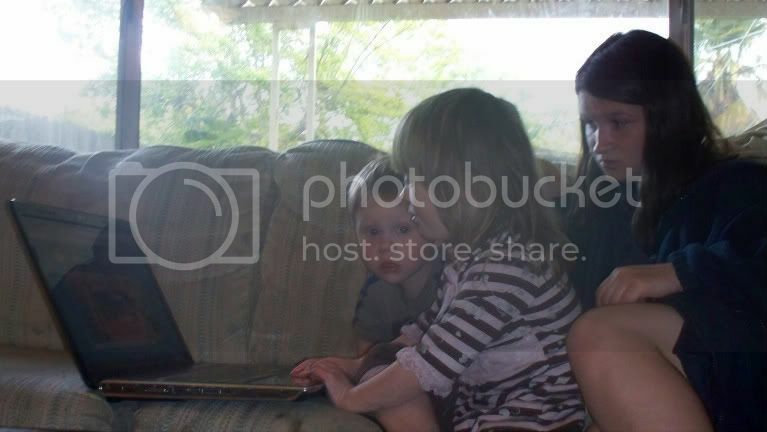 It's funny how kids will gather around a little screen, if there is a game on it. Thanks so much for the nice words on my happy birthday post to Logan last week. Hope you and your family have a great weekend! Mine is 3 and she loves computer games! So cute! Kids are way too computer savvy these days, aren't they?